What is the truth about the Lost Colony? – New insight into America's oldest "mystery"
Scott Dawson in the field showing his daughters how to do archaeology. This isn’t an article about Adam Fletcher. And it isn’t even an article about Colonial Beaufort, or even Colonial America. Recently, more than one television documentary has offered viewing audiences one spin after another about one of America’s favorite historical mysteries–the Lost Colony. Through my work with Coastal Carolina Indian Center, as well as my own roots in the region that go back to the earliest colonists and the Algonquian peoples of the coast, I have always had a particular interest in the Lost Colony, but also the other Roanoke expeditions as well. (Yes, there were others.) It was in those expeditions that Thomas Harriot recorded his experiences with the first indigenous Americans who ever encountered the English. It was during those same expeditions that John White created the beautiful watercolor illustrations that give us a glimpse of what life was like in America in the 1580s. When one has a personal connection to a certain history, it tends to inspire a great passion about it. That seems to certainly be the case with Scott Dawson, who along with his wife, Maggie, founded the Croatoan Archaeological Society. I’ve known Scott for years. He has contributed articles and materials to our CCIC website. Earlier this week I interviewed him about recent discoveries related to the Lost Colony and the related Roanoke expeditions, as well as what his organization is doing to help uncover a fuller picture of the history. Q – A lot of news articles and documentaries have been coming out over the last year relating to the Lost Colony. In fact, I understand there was one on the History Channel recently that talked about the Dare Stones. What do you know about that? A – I was on the History Channel a few years ago and they were doing a show about the Dare Stones, but they never told me that was what the show was about. When they contacted me they said it was about the “lost colony” and they were interested in the archaeology we had been doing in Hatteras. I had no idea it was a quack show or I would have never agreed to go on it. The Dare Stones are a hoax, as any reasonable person can tell. The first stone was found the year the Lost Colony play came out in 1937. When that play began, it created the mystery of the “lost colony” to sell tickets and the public was hoodwinked into thinking it was a real mystery. Magically, the first stone pops up and is authored by none other than a member of the Dare family, of course. The entire area where the stone was found was excavated, but nothing was found. Later, 41 more stones were found–none of them even in the state of North Carolina–and all by just four people, which it turns out all knew each other and even tried to blackmail a professor into saying they were real. It was put to bed as a hoax a long time ago in the 1940s, but I guess it makes good TV–so there you have it. The idea the colony walked to the outskirts of Atlanta and left a trail of stones behind and no other artifacts is probably the dumbest of a host of stupid theories out there. Q – The outdoor drama about the Lost Colony has been really popular over the years and is a big tourist draw. Would you say that it’s an accurate portrayal of the history? The Lost Colony play has been a tourist draw and that is why it was created. I don’t think the play even pretends to be accurate. Almost nothing about the play is accurate. The very idea they are lost isn’t even accurate. Real history from the primary sources is not ambiguous at all about the fate of the colony. The “lost” colony of 1587 was the fourth English voyage to North Carolina. This watercolor of Secotan–an Indian village that was across Pamlico Sound from Hatteras island–was created by John White during one of the Roanoke expeditions. The first voyage landed at Hatteras Island–then called Croatoan. This is the voyage that met Manteo–who was from Croatoan–not Roanoke. They only spent one night on Roanoke Island during the six-week stay of the first voyage. A relationship had begun with the Croatoan of Hatteras Island that continued for years. The second voyage had English people living on BOTH Hatteras Island and Roanoke Island. The English were at war with Indians from the adjacent mainland and killed their Chief and burned one of their villages before going back to England. The third voyage was just 15 men left on Roanoke who got attacked by the mainland Indians. The fourth voyage was the one known as the Lost Colony and they were only stopping by to get the 15 men from the year before, only to discover they had been killed. The Lost Colony also had a man, George Howe, [who was] killed in 1587 by mainland Indians. When this happened, they sent 20 men with Manteo to his home, Hatteras, to get help. They were hosted to a feast and told that the Croatoan of Hatteras would try to smooth things over for the English with the mainland. Instead, they sacked a mainland village and stole all the corn and split it with the English. When the governor left and instructed the colony to carve out where they had moved to, it was no shocker that they wrote “Croatoan.” This is a tribe the English had known for years and the only tribe in the area who did not want to kill them. These are facts. Unfortunately, if you tell the facts from the primary sources you can’t pretend the colony is lost and thus you won’t sell as many tickets. Q – What is your connection to this history? Why is it something that you care so much about? A – I am a history teacher in Elizabeth City and as I tell my students what matters the most is the truth. I feel like the mythology of the Lost Colony is a slap in the face to the Croatoan people. In the real history, they fed and cared for the English and undoubtedly adopted them in the end. Yet in the mythology, they are marginalized to a strange message on a palisade and all mention of their contact with the English is swept under the rug. Q – You have been researching this history for years and you’ve found many archaeological artifacts, right? Many of them you have found just living on Hatteras? A – I grew up on Hatteras and my Mother’s family has lived there for at least eight generations. We go back to the Croatoan who were still living there well into the 1750s. There was a land grant to the Hatteras Tribe in 1751 that was signed by the colonial governor Arthur Dobbs. My family still lives on that land, as well as many other families, most of whom have been doing so since they were wearing deerskins. I have found thousands of pieces of pottery and other artifacts and started doing so when I was 10 years old. Now I head a non-profit group and got professionals from the University of Bristol to start doing archaeology there for the last seven years. Anyone who knows me knows I told them exactly where the Croatoan villages were and predicted 16th century material would be in the village. So far we have located more than one Croatoan village and found several 16th century English artifacts mixed in with Croatoan exactly where I and pretty much everyone on the island has always said it would be. Q – I’m aware that a university in England has taken interest in digging at Buxton. How did the Croatoan Archaeological Society (CAS) come to partner with an archaeology team from across the pond? And why do you think North Carolina universities haven’t gotten involved? A – North Carolina Universities would probably love to be involved, but unfortunately, the property owners–at least most of them–do not trust them. ECU did some digs in the late 1990s and they also took artifacts that people had brought for them [back to the university] to look at and never returned them. It is a very small community and they burned that bridge. The University of Bristol (UoB) from England was a good choice, after all, this is their history too. We have always had American volunteers and many Americans from the University of Michigan, William and Mary and South Carolina have been involved in one way or another. In fact, our last dig was mostly Americans. Usually the British outnumber us on these digs, but it is a great opportunity for the school kids of Hatteras to get some exposure to a different culture. The UoB students have done digs at the high school with local students and we actually found some pottery from about the year 500 behind the school. CAS is a community organization so we work with the school and do all kinds of programs for the kids. UoB has been wonderful. I can’t say anything but positive comments on their work ethic, professionalism and dedication. Dr. Mark Horton is the leader and when I met him in 2009, he had me pick the places to dig, secure permission, and off we went. The finds were so amazing he told me we needed to get organized and form CAS, so we did. Q – What have been some of the most interesting finds in your excavations? A – Everyone would answer this question differently. Obviously the English stuff from the 1500s such as a writing slate, a rapier (sword handle) and the Nuremberg token, copper bun, Elizabeth glass and all the “lost” colony stuff is at the top of the list for most. For me it is seeing the postholes of the Croatoan longhouses and knowing exactly where their houses were. I also like the really old stuff we have found–some of the spear points are thousands of years old. I like anything with art on it too, especially the Native pottery and some of the decorated pipes. The whole thing is amazing. It is as close to time travel as it gets. 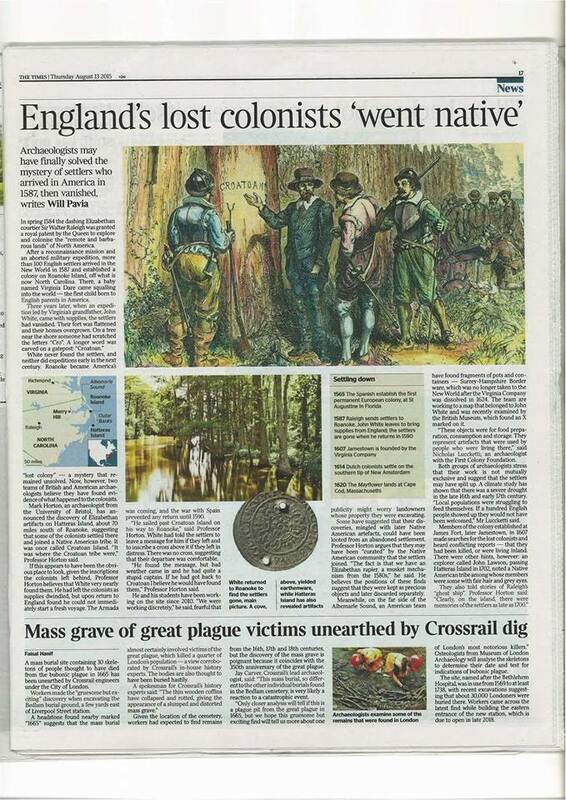 Q – What do those finds mean for interpreting the history of the so-called Lost Colony? A – It means the “lost colony” wasn’t lost. They were abandoned and went exactly where they indicated they went with the CROATOAN message. If anything is a mystery, it is that no one looked in the most obvious location for almost 400 years. It goes to show how few people actually read primary sources and how much misinformation is circled around by so many so called experts. It is sad really, because now that we have the evidence we have to deal with these competing theories that have no basis in reality like the Dare Stones, or Beechland, or Bertie. If people would just read the historical context of the colony they would know that going inland would be like a Jewish family during World War II fleeing Poland by going to Germany! The mainland was attacking and killing the English, whereas Croatoan had been feeding and protecting them for years. Not to mention the fact the colony carved “CROATOAN” in the palisade to indicate that is where they went, and now we found their stuff there. It’s irritating, but I think any reasonable person can understand the colony went to Croatoan if given the facts. The London Times featured the work of the archaeological discoveries documented by Professor Mark Horton (University of Bristol – England) along with Croatoan Archaeological Society. Q – In your opinion, what happened to the Lost Colonists? Where did they end up? Did they survive? Did they–as some have suggested–go into the sassafras business? First of all, sassafras grows all over the state–including Hatteras, and even Roanoke–so the idea they would go inland to get it is like saying they went inland to get pinecones or acorns. Clearly, they went to Croatoan as they indicated. I do not think they faired very well regardless of where they went because Jamestown is only 20 years later and no one ever sent word to Jamestown saying anything. If you look at Jamestown almost all of them died in the first few year–and they had help from Indians too. It is only by sheer weight and constant resupply that they managed to survive. This is not to say that some colonists did not pass on a few offspring with the Croatoan. In fact, in 1701 John Lawson reported grey eyed Indians on Hatteras who told him flat out that they had white ancestors who came on Sir Walter Raleigh’s ships. Most likely what was left of the 1587 colony died off in the winter of 1602. This was a record cold winter due to a volcano that erupted in South America and caused record lows across North America. Who knows? Saying the colony went to Croatoan is one thing, but after that it is a speculation game. In my opinion they didn’t do too well, passed on a few children with the Croatoan, and perished. If they had lived and thrived they would have contacted Jamestown and no one did so. Q – Everyone always talks about the colonists, but what about the Indians? What happened to the indigenous people from Hatteras? Did they survive? The Natives of Hatteras like so many other tribes on the coast did survive but they were greatly reduced by disease and war. They fought on the side of the English in the Tuscarora War in 1711 and we have a handful of references to them in the 1700s when they had been reduced to less than 100 people. The archaeology shows they were still thriving in the 1600s with a healthy diet of deer, fish, birds, turtles, shellfish and that they had some access to European trade goods like brandy and guns. In the end they intermarried with white people and stayed on the island. That is where my family comes from, as well as most other old families on the island. Many visitors to the island in the 1700s reported a mixed race community living there and by the late 1700s the archaeology goes completely European. Q – What have you found to be some of the biggest misconceptions regarding the history about the Lost Colony and the indigenous people of Croatoan and the surrounding areas? Another misconception is that the Croatoan did not live on Hatteras year round. We can prove they did, and in fact have for thousands of years. Another misconception is that Croatoan was some strange word left by the colony. It is a real place and real people that the colony had had contact with since 1584, and a known ally of the colony. I think that might be the biggest misconception. There are so many misconceptions, most of which were created to aid the mythology. Q – Where can people learn more about your organization and its discoveries? The Croatoan Archaeological Society website is www.cashatteras.com or they can find us on facebook. Also, my book Croatoan: Birthplace of America, details a lot of the history. We also have displays of the artifacts at the county library in Hatteras Village that can be seen for free. We are updating that location soon with new cases and more artifacts. The whole point of CAS is to preserve the real history of the island and share it with the world. We have a few discoveries that have not been announced yet and no doubt more to unearth. Stay tuned, or better yet sign up and join us to be a part of history! Previous Post: « Smuggling in Colonial America: What drove good men to do it?